When people are asked to name a historical point that D&D most closely represents, they'll usually say something like 'The Middle Ages', or perhaps a date between 1000 AD and 1500 in Europe. Truth be told, to find a historical period which has a social setup anything like D&D, you're going to have to go back. Way back. D&D represents a period in history that is most closely identifiable with the Iron Age: the landscape is dotted with tribes and aspiring empires, the wilderness is largely unexplored, and powerful individuals and small groups can take over an area without having a big geopolitical hubbub about it. FARK.com: (2146013) Like your broke stoner friend in college, Bernanke hits us up for another quarter: "Like your broke stoner friend in college, Bernanke hits us up for another quarter"
You'll never get any respect with that fake plastic pitchfork, dude. This massive work on the history of evil, particularly as symbolized by the Christian devil, was written on the cusp of the 20th century by Paul Carus, who wrote such other books as 'Buddha, the Gospel'. At that point in history it seemed apparent that evil would soon be eliminated by the onrushing forces of rationalism and modernism. The devil had been reduced to a literary character, always ready to make a silly bargain for a soul. This trivialized image is perpetuated to this day. 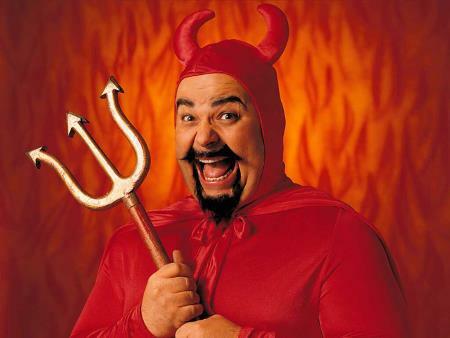 Satan in the cinema is either represented as a hideous special effect or a comic, bumbling trickster. Long gone is the noble adversary of Jehovah, as portrayed in the Bible, Milton or Dante.
" Culture and Tourism Minister Atilla Koç said on Tuesday that a sign to the entrance of Bodrum Castle's dungeon stating Where God Does Not Exist in Latin would remain in place. Newspapers on Tuesday criticized a Culture and Tourism Ministry decision to order the removal of what was thought to be a 500-year-old sign. While notices pointing to the dungeon have already been removed, officials were wondering how they can remove the Latin words Inde deus abest, which are carved in stone. Koç, speaking at a press conference, said investigations had revealed the sign had no archeological value, adding that a new commission would be sent to the castle this week to confirm those findings. "US satellite TV company DirecTV has signed a deal with the Cyberathlete Professional League (CPL) to broadcast a series of video game events. The moment at 1:28 in the clip made me laugh oh so hard. Juvenile, but funny. 'Space Invaders' from the alien's point of view. I likey. emotion lotion! magnet that states "I've got a five inch taint"
A young girl discovers the joy of entering womanhood. From Wonder Showzen. That was one of the best freaked-out, spazzy, angry public displays of emotion I've seen in a while. "Millions of computer-generated entities that live and die by natural selection could reveal how our own culture and language evolve. "Let’s go back to the 6th or 7th century. Latin scribes tried to save a little effort by shortening the Latin word ad (at, to, or toward) by stretching the upstroke of “d” and curving it over the “a”. Amazing. 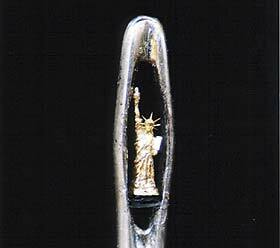 Check out the link for more incredible and tiny sculptures. "When you view these works, you're entering a new world that is yours for that moment. Looking inward is engaging the soul and leads to peace"
HAHAHHAHAAAA! So funny.... so wrong. Watch all the way to the end for the haha. I guess it might be NSFW, but I laughed oh so hard at the outcome. "A NEW website allows meanies to take a punt on how long its featured newly-weds will stay married. Photographs of happy couples are put up and visitors to weddingbetting.com can cast a vote on their future. Alongside their picture is a brief synopsis about them and the options for your prediction: barely past the altar, one year, five years, eight years, 15 years or happily ever after. The site logs the number of votes on each partnership and then lists percentages on whether or not the couple will get divorced. If there's a high chance of divorce, according to votes, then the site states the time period before they may end the marriage. "Elite special forces troops being dropped behind enemy lines on covert missions are to ditch their traditional parachutes in favour of strap-on stealth wings.